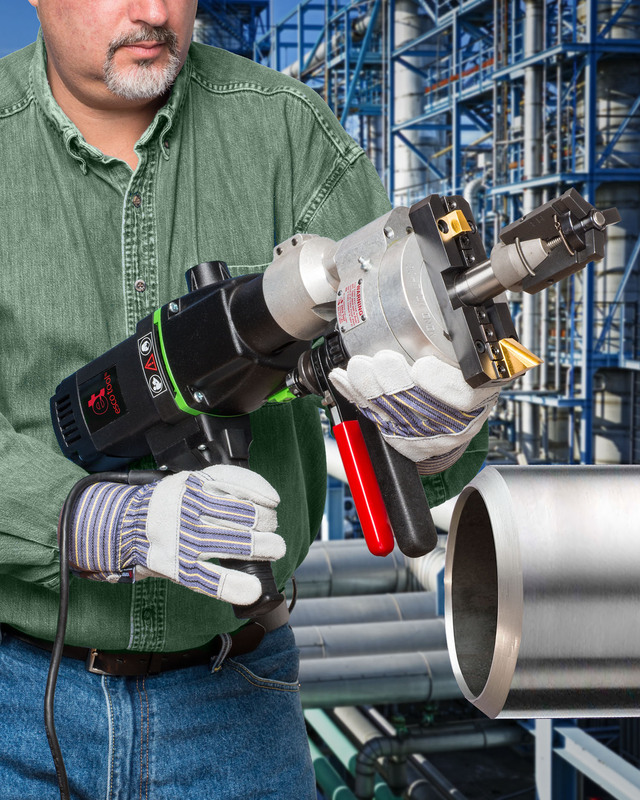 A new, electric portable pipe machining tool that is a powerful alternative to pneumatic tools for end prepping boiler tubes and other pipe fabrication work has been introduced by Esco Tool of Holliston, Massachusetts. The ESCO MILLHOG® Mini Electric Pipe Beveling Tool rigidly mounts to the tube or pipe I.D. and is suited for end prepping heavy-wall stainless steel pipe and other highly alloyed metals when compressed air is not available. Featuring a high-torque variable speed motor that spins at 19 to 66 RPM, it is ideal for beveling hard and soft boiler tubes and pipes from 1.25” I.D. to 6.625” O.D. and pulls a thick chip without needing cutting oils. J-preps, the ESCO MILLHOG® Mini Electric Pipe Beveling Tool utilizes the same proven EscoLock cutter blade holding system as the air-powered version of this tool. Designed for repetitive end preps, it has a heavy-duty gear drive and all clamping components are heat treated including the draw rod.